Nearly a week after penning a letter to customers about why it's refusing to hack into the iPhone of San Bernardino shooter Syed Farook, Apple CEO Tim Cook wrote to employees on Monday morning as the company posted an FAQ page. 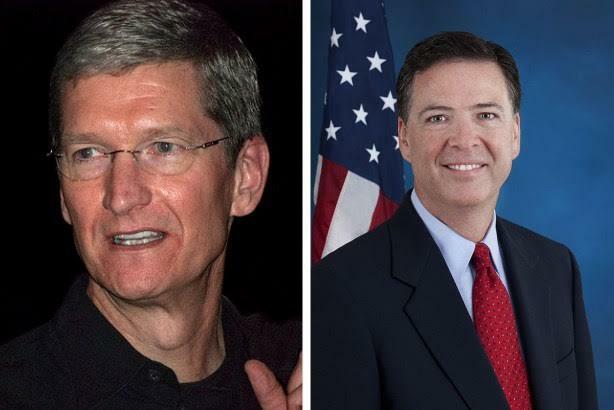 Apple CEO Tim Cook (l) and FBI Director James Comey. Apple CEO Tim Cook told employees in a memo on Monday morning that "the data security of hundreds of millions of law-abiding people" is what is at stake in the company’s standoff with the FBI. The federal law-enforcement agency had asked Apple to create a backdoor into the iPhone of Syed Farook, who, along with his wife, killed 14 people at a community center in San Bernardino, California, last year. The company is resisting the request, arguing that doing so could open up the data of its customers to cybercriminals, as well as the government. "This case is about much more than a single phone or a single investigation, so when we received the government’s order, we knew we had to speak out," Cook said in the memo, obtained and verified by BuzzFeed. "At stake is the data security of hundreds of millions of law-abiding people, and setting a dangerous precedent that threatens everyone’s civil liberties." The memo linked to a Q&A page Apple published about the controversy. It answered questions such as "Why is Apple objecting to the government’s order?" "Could Apple build this operating system just once, for this iPhone, and never use it again?" and "Is there any other way you can help the FBI?" The memo and Q&A document are in the vein of Apple’s letter to customers, published last Tuesday, that laid out the company’s case as to why it is not unlocking Farook’s mobile device. A USA Today poll conducted last week found that public support was split between Apple and the FBI. Protests in support of Apple, planned by the group Fight for the Future, are planned for Tuesday in 30 cities around the globe. FBI Director James Comey commented on the matter in a post on the Lawfare blog on Sunday. Although he did not mention Apple by name, Comey asked the parties involved to tone down the rhetoric. "Reflecting the context of this heartbreaking case, I hope folks will take a deep breath and stop saying the world is ending, but instead use that breath to talk to each other," he said in the blog post. "We simply want the chance, with a search warrant, to try to guess the terrorist’s passcode without the phone essentially self-destructing and without it taking a decade to guess correctly," Comey continued. "That’s it. We don’t want to break anyone’s encryption or set a master key loose on the land." A brief survey of Twitter on Monday morning found the majority of the most-retweeted comments on the matter supported Apple. Claim Apple is doing this "only" for PR benefit is bizarre: PR in refusing FBI's demand to open phone of Muslim who mass-murdered Americans?